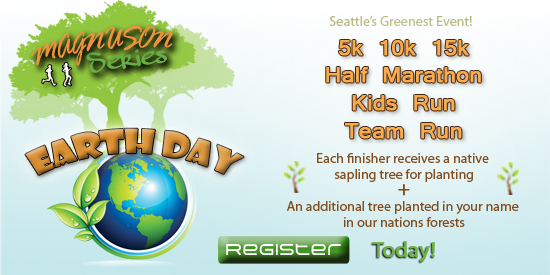 Come down to Magnuson Park this Earth Day and you can participate in the Earth Day Run with the Magnuson Series or just stop by to pot some trees for the parks department or to take home yourself. We will also have an onsite planting location if you would like to plant your tree in the park. Head to the Tree Hugger Station by the Magnuson Beach House to get all the info and plant a tree. We will have 100 native plants and tree's to add to our planting location on both sides of Sports Field Dr. We are encouraging volunteers to come plant with us. You can come for a part of the event or the whole event whatever works with you. We will provide gloves and all necessary tools as well as give instruction on proper planting techniques. Also, we will have some extra native tree's and bushes so if you have a spot in mind that you would like to plant and can make sure to water during the summer let us know and we can give you some plants to take home. Please RSVP here https://www.eventbrite.com/e/fall-planting-party-tickets-37348031969. We will have over 150 native plants and tree's to add to our planting location on both sides of Sports Field Dr. We are encouraging volunteers to come plant with us. You can come for a part of the event or the whole event whatever works with you. We will provide gloves and all necessary tools as well as give instruction on proper planting techniques. Also, we will have some extra native tree's and bushes so if you have a spot in mind that you would like to plant and can make sure to water during the summer let us know and we can give you some plants to take home. Please RSVP here https://www.eventbrite.com/e/fall-planting-party-tickets-37348031969. Time to clean up that carbon! We will have native tree's and bushes that need to be planted in the location below. Tools and instructions will be provided. Planting in this area will have a cooling effect on the pavement of Sports field drive, it will help retain water and prevent excess water and flooding to the fields below, provide habitat for wildlife as well as take in and store over 1000 lbs of Carbon! Not to mention naturally purifying the air and water that get filtered through the tree's and plants. 2016 Earth Day Run @ the Magnuson Series! www.magnusonseries.org/earthday for all the details. 2015 Fall Planting @ Magnuson Park Sunday Dec. 6th noon-3pm. 2015 Earth Day Run @ the Magnuson Series! We will have native tree's and bushes that need to be planted in the location below. Tools and instructions will be provided. Planting in this area will have a cooling effect on the pavement of Sports field drive, it will help retain water and prevent excess water and flooding to the fields below, provide habitat for wildlife as well as take in and store over 1000 lbs of Carbon! Not to mention naturally purifying the air and water that get filtered through the tree's and plants. We need your help!